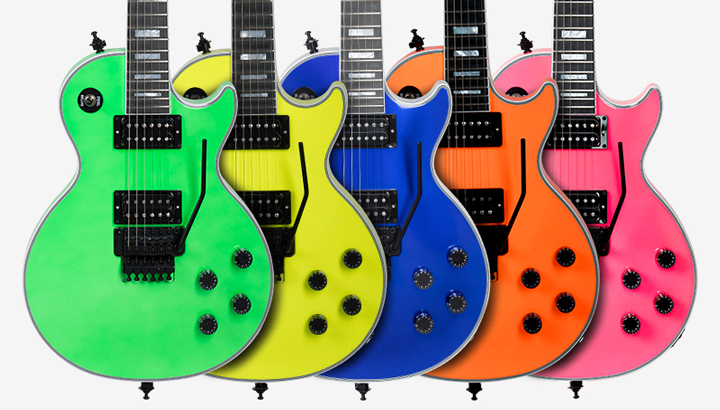 Earlier this week, Gibson released images of a new limited run of Les Paul Custom Axcess models with vibrant, neon finishes. As you can see in the image below, the new finish options include neon green, yellow, blue, orange, and pink. These guitars are the latest in the "Axcess" variation on the Les Paul design which adds a curve to the back of the body and near the neck joint for easier access to the upper frets. There have been a few different Axcess Les Paul models released over the years, and this Custom version also sports a Floyd Rose Tremolo and Les Paul Studio-style black "speed" knobs. Like most Les Paul Customs, the body is made of mahogany, though this model is listed with a Richlite fingerboard instead of traditional ebony. What do you think of these new retro finishes? Let us know in the comments.